If there is one stretch of road worth driving more than any other in the Cape Winelands I would have to say it is the windy mountain pass linking the historic oak lined university town of Stellenbosch and the fertile Banhoek valley leading into the French Huguenot town of Franschhoek. Not only are the vistas absolutely extraordinary but the wine farms, attached like amulets on a chain, each have a unique story and are each a worthwhile destination boasting top wines, restaurants, delis, accommodation, art galleries and sculpture gardens. The ‘Helshoogte’ or Hell’s Heights Pass otherwise known as the R310 was originally built in 1854 and then upgraded in 2010. It links the wine districts of Franschhoek and Stellenbosch and is 15 km long with the summit reaching 387m above sea level. If you are coming from the Franschhoek side on the left is Boschendal which has undergone a renaissance and become a real destination winery with plenty on offer. When my brother got married ten years ago the 3 day wedding extravaganza for their overseas friends who had travelled to the Cape Winelands culminated here with ‘le pique-nique’ on the Sunday. 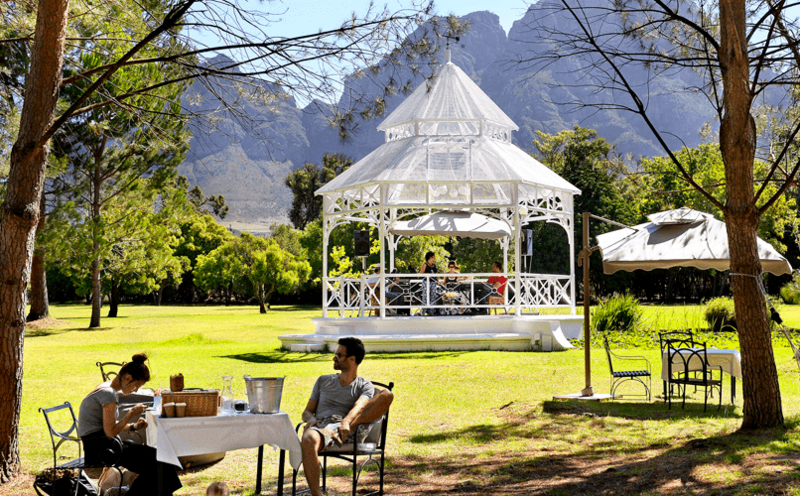 Boschendal pioneered the luxury wine farm picnic with beautifully presented hampers of fresh farm goodies to be enjoyed in the verdant grounds. Further up Helshoogte you will pass through the small village of Pniel in the shadow of the Simonsberg Mountains. It is here where the first freed slaves chose to settle in 1842 after the abolition of slavery in the Cape in 1833. Its name comes from the book of Genesis in the bible and means ‘face of God’, an apt name for such divine surroundings. Just before you reach the top of the pass on the left is a very special farm called Bartinney, overlooking the Banhoek valley. Owned by one of South Africa’s leading businessmen, the story goes that due to financial constraints the family farm passed out of the Jordaan family hands, but was able to be repurchased by the son who now lives there with his young family. Delicious Cabernet Sauvignons come from the Banhoek valley and I recently had the privilege of enjoying a tutored tasting conducted by the female winemaker Ronell Wiid at this boutique winery. At Bartinney sustainability is a business philosophy and the sustainable farming practices are seeing the return of wildlife and birds such as Guinea fowls. The shy Cape Leopard has also been sighted in the mountains above the farm. 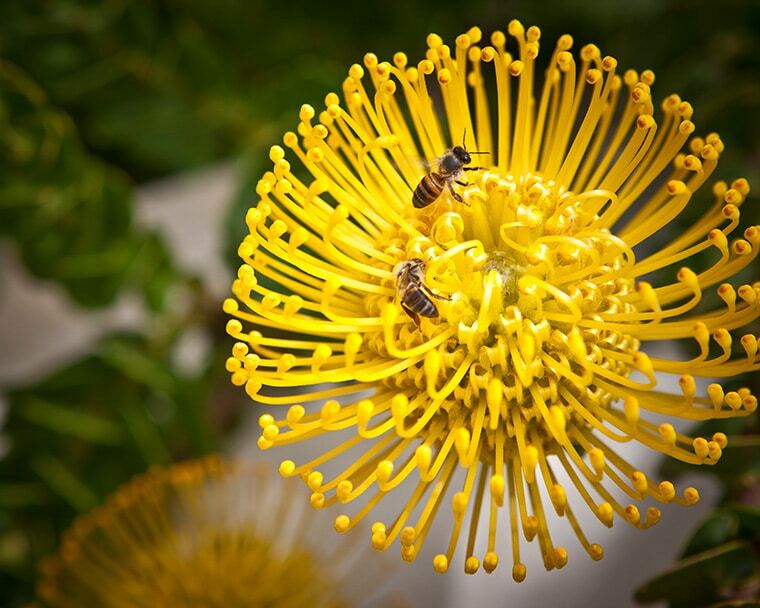 Social balance and harmony is regarded as equally important as environmental balance at this forward thinking winery, where the effluent from the wine-making process flows though the fynbos, indigenous to the Cape Floral Kingdom. By removing alien vegetation such as Blue Gums and Pine, a spring that had been dormant for 40 years recently started flowing. When my father turned 60 some years back he invited his friends to join him on a tour of the Winelands. A bus was hired and off we set confident in the knowledge that no-one had to drink and drive especially when navigating the windy pass. 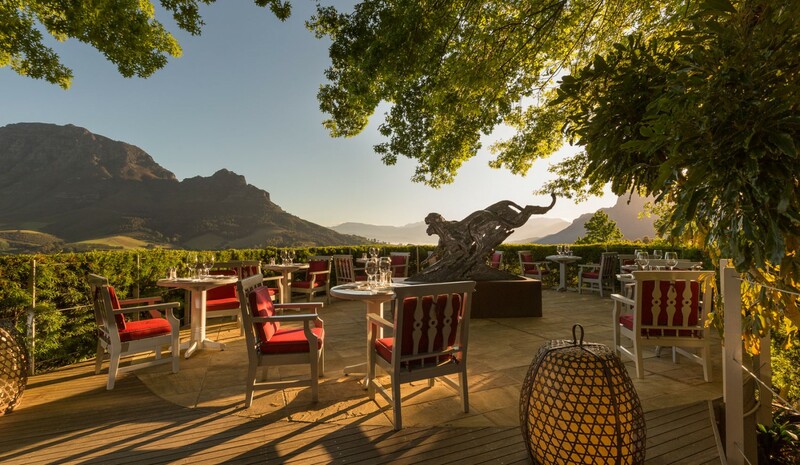 The chosen lunch venue was Delaire at the top of Hell’s Heights then owned by Erica and John Platter of Platters – the wine bible of South Africa fame. The simple country lunch we enjoyed was memorable. Today my father would not recognise what has now become ‘the gem of the Winelands’. Delaire-Graff owned by the founder of luxury jeweller, Graff Diamonds, Laurence Graff is a seriously impressive destination winery designed to leave visitors breathless. The gardens were created by South Africa’s leading gardener and celebrity horticulturalist Keith Kirsten and each season offers the visitor something new. Not only is the best of South African art on display but award-winning restaurants commanding magnificent panoramic views make this destination winery at the pinnacle commanding 360 degree views Table Mountain in the distance a must-visit. Across the road from Delaire-Graff you will find the well-known estates Thelema – recently rated one of the world’s top 100 estates and Tokara – known for their excellent wines, restaurants, olive oil, art galleries and charismatic winemakers. Thelema has a lovely old world feel nestled into the valley. Owner and viticulturist, Giles Webb, a former accountant planted all the vines. As a student the first ‘sophisticated’ white wine I can remember which made an impression on my palette and which I could order with confidence was Thelema’s Blanc Fumé which they sadly no longer produce – we are talking more than a quarter century ago and one thing is for sure is that all these wineries are dynamic, constantly re-inventing themselves! 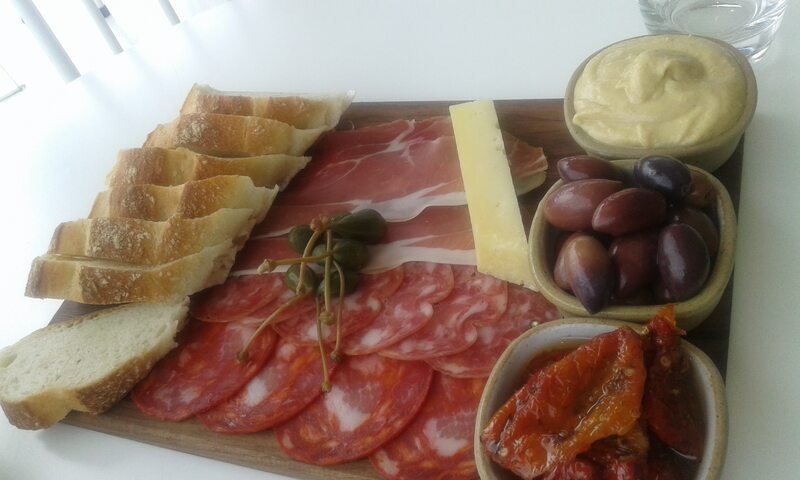 Tokara is housed in super modern buildings with gorgeous views. Original art works by South African Masters such as William Kentridge are to be spotted on the walls. The small gallery annually hosts an artwork competition where students are invited to paint around a theme using red wine as their medium. The results are astonishing and one can imagine the fun the students have in producing them. The sculpture garden walk through the olive grove between the more relaxed deli and fine dining restaurant is also well worth doing. It might be called Hell’s Heights but the views as well as the offerings are certainly heavenly. A leisurely drive over this short but dramatic pass with multiple stops is a treat not to be missed and a delight for the senses on every level. Great tips and insights. Fun to do a series on passes and their hidden delights. Couldn’t agree more on the change in Delaire – from rustic to luxurious! Great insight into how much there is to explore so close to Cape Town. Always on the lookout for winelands tips, thanks!